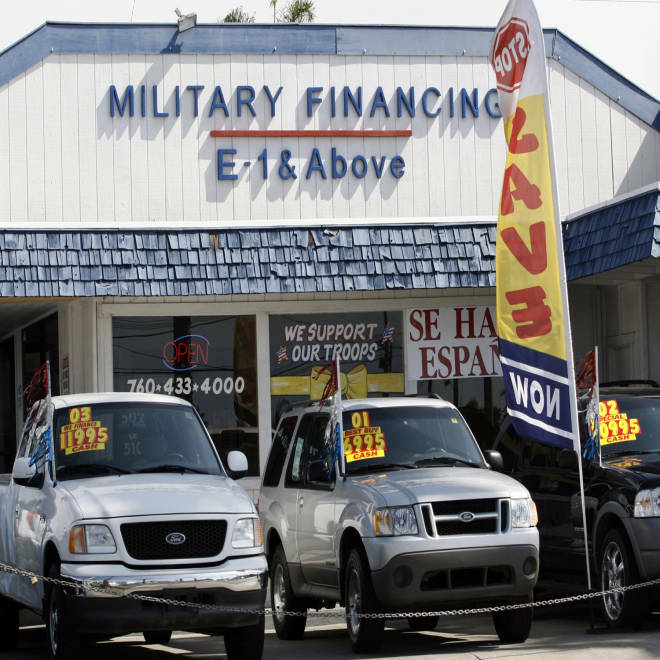 A sign offers military financing at a used car lot in Oceanside, Calif. on Oct. 12, 2006. The lot is one of many businesses in downtown Oceanside that offer credit to Marines from nearby Camp Pendleton. Nearly 36,000 active-military members who hold security clearances have recently sought urgent financial advice or aid because heavy debts and delinquent bills threatened to void their classified status, according to a nonprofit that helps troops and veterans solve money problems. “You can lose that security clearance if you have credit or debt issues,” said John E. Pickens III, executive director of VeteransPlus. “If you lose that clearance, you can become un-promotable or you can be taken from your assignment. And, ultimately, you can even receive a bad-conduct discharge. Pickens’ nonprofit has offered financial counseling to more than 150,000 current and former service members. Among that crowd of clients, more than half are active duty, National Guard members or reservists. And out of that portion, he said, 46 percent have expressed worries about their security clearances. Approximately half of America's 2.4 million active duty, National Guard and reserve troops hold some level of security clearance, said Pentagon spokesman Lt. Col. James Gregory. Most of those 1.19 million service members possess the second-highest security rating - "secret" - while the next largest portion hold a higher status: TS/SCI, (Top Secret/Sensitive Compartmented Information), he added. The sensitive nature of certain military jobs typically dictate the security classifications. Asked to confirm that massive debt and late payments are, indeed, the leading factors in security-clearance terminations, Gregory said: “One reason (for concern) is that a person with big debts is more likely to accept money in exchange for revealing secrets. So that's why financial things are one of the biggest reasons that a clearance would not be granted or be revoked. Based on the financial counseling sessions provided by VeteransPlus, statistics show that service members and veterans who approach the nonprofit have an average debt-to-income ratio of 46.5 percent, Pickens said. According to “The Ultimate Credit Handbook,” by Gerri Detweiler, a debt load of 36 percent or less is healthy for most people to carry, but a ratio of 43 percent to 49 percent means that dire financial difficulties are probably imminent unless immediate action is taken. The nonprofit’s counselors also see an average unsecured debt (such as credit cards) of $9,700 and an average secured debt (such as a home) of $16,500. “I wish I knew that number,” Pickens said. “But if you’re not paying your bills and your debt-to-income ratio is what the military would consider to be excessive, they look at you as a risk. In April 1990, Derek Staden, then 19, learned he was about to be deployed from his Air Force base in Wichita, Kan., to the Middle East as the U.S. military launched Operation Desert Storm. Then a senior airman whose duties included refueling aircraft, Staden’s mailbox suddenly was flooded with offers for credit cards and high-interest loans. When Staden returned to his base later in 1990, those same creditors demanded that he repay the loans or balances or they would report him to his commanding officer. He knew his security clearance would be at risk if his superiors learned of his unpaid bills. He had earned that classified status during basic training. He needed the clearance because he was involved in secret, Cold War practice drills during which he refueled aircraft. “I had to keep those payments up to speed because the military frowns on having debt issues like that,” Staden said. “It wasn’t an option to call my parents and ask for help because they taught me growing up how to be responsible for your obligations. I didn’t want to call them to tell them I’d been duped by creditors. Staden, who left the service in 1995 and now lives in New Orleans and is trying to get into the music-production business, estimates that his debt ultimately reached in the low $20,000 range.